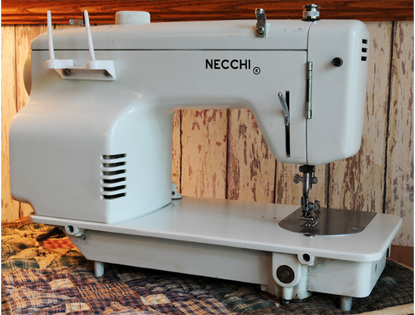 This is our Necchi MOD-539 sewing machine. It probably was a cabinet model as there are two 110-volt connectors. A foot control having a "Motor" and "Light" plug-in was required and fabricated by jim. 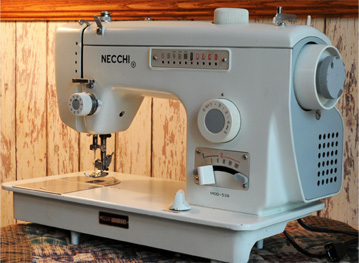 The machine has been used to make an apron (prior to taking an artisan bread baking class at John C. Campbell folk school). There is quite a bit of noise emanating from the bobbin case area and we are trying to isolate the cause. 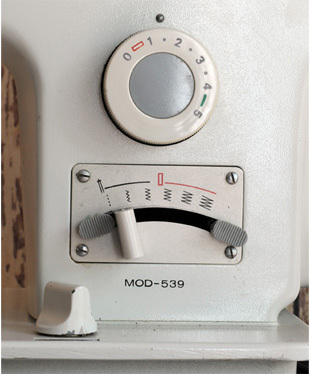 The MOD-539 seems to be a basic machine which is easy to thread and operate. 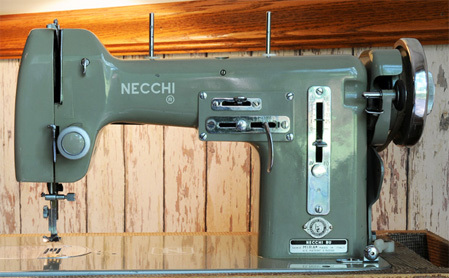 The top knob is used to select stitch length, the lever in the arc selects stitch width (zig-zag) and a knob on the bed drops feed dogs. Five patterns are available using built-in cams. Also, button holes can be created by moving the selector to each successive stop in the red area to form the required rectangle. Some practice is required to get the desired size. 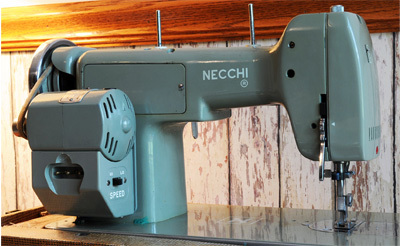 Don't try to use its button hole feature for the first time on your fine fabric. 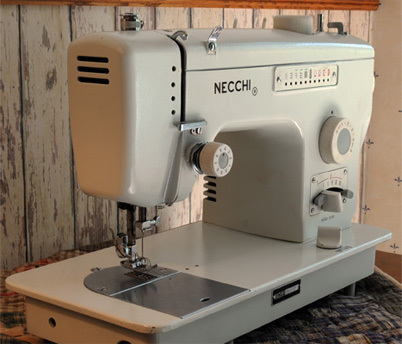 The machine has a vertical bobbin and bobbin case which many will say produces a nicer stitch. Needle is Standard 15x1. 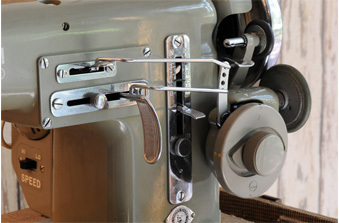 The slide plate is easily removed and its size is larger permitting easier access to the bobbin. Note the generous number of feed dogs. They pull fabric through the machine straight and forcefully. The needle throat plate lifts right out and is not held in place by the screws shown. Pictured above is our Necchi BU Mira. It is a metal machine and heavy. Nevertheless, it is a fun machine to use. The Wonder Wheel is a real "vision" to watch while in operation. We don't have the machine dated as yet, but judging from how primitive the Wonder Wheel is, we suspect it was among the first such attempt at fancy stitches. On the rear of the BU can be seen the motor and access plate for service. Below the motor is a switch which can select low or high motor speed. The Wonder Wheel is installed in the above image. The Wonder Wheel is bolted to the machine by a single bolt. We pushed the drive wheel against the hand wheel when we wanted to sew patterns. Notice there are two levers attached. 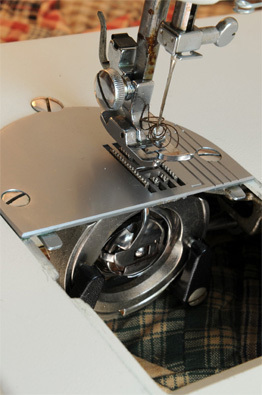 The top rod is connected to the needle left-right control while the lower rod connects to the stitch width control. The disk contains patterns which drives the pushrods. Apparently four discs were made and we have one. Each disk has a different pattern on each side. 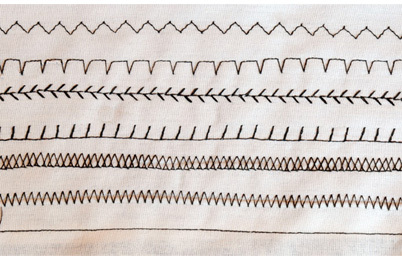 Below is a sample of patterns sewn on our Necchi BU Mira using our only Wonder Disk.